In our recent photoshoot with model Vamp we created a creepy nurse look inspired by shironuri style! 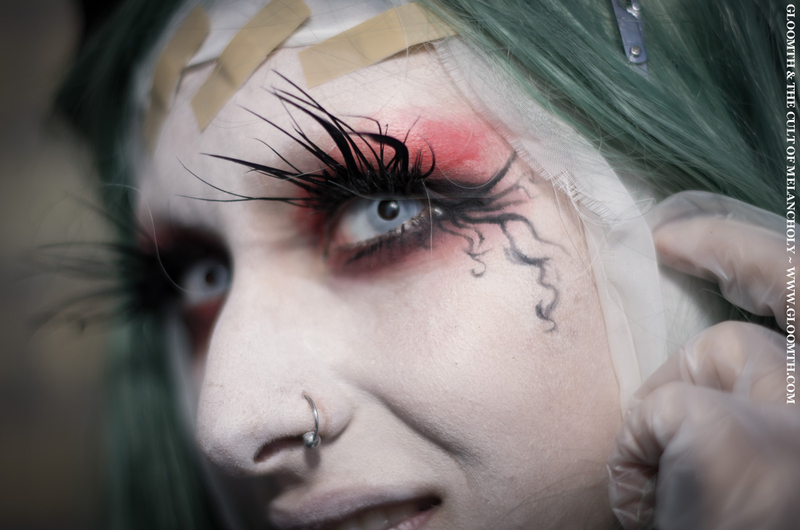 We posted a full tutorial recently to creating your own shironuri inspired makeup look. If you’d like a quick history on the style and it’s influences (and for the complete how-to’s) do check out that article (here). Today we’re going to explain how we created the medical-themed scary look shown below! We began with the typical shironuri whited-out face, we used Kryolan’s aquacolor in matte white and set it with a white powder afterwards. We used white Kryolan aquacolor as lipstick. We blended it down our model’s throat, which we wrapped in torn strips of white gauze to mimic bandages. The eyelashes we used for this look were handmade by me! We have a tutorial (here) on how you can create your own custom eyelashes, which is a great way to make your shironuri style truly unique (not to mention save money on false eyelashes)! For the sunken creepy eyes we first laid down a base of blood red kryolan aquacolor (matte) and blended it outwards below and above her eyes, right up onto and above the brow bone. Blend outwards using a makeup sponge or your fingers, fading the color the further from the eye you get. We then took black Kryolan and lined the eyes and smudged them out, blending the black into the red. Added mascara and then the enormous false eyelashes! The last makeup step for this look was to create the delicate finials swooping under her eye. We used black aquacolor with a pointed brush to make curls and lines curving down onto her cheekbone. For added spooky-points incorporate torn strips of gauze or cotton for bandages, band-aids, and medical tape for a detailed look! Vamp wore this look with her own creepy colored contact lenses.